Posted on January 14, 2019 February 3, 2019 by Tunes in T.O. Every Monday morning you can find my weekly playlist here. Feel free to follow on Spotify and let me know what you think. If you’d like to have your music considered, or have an upcoming event in Toronto, please email me at ryan@tunesinto.ca. Fresh off of having the title track from Separate Rooms be selected #2 by Canadian fans, and landing in the Top 100 of 2018 by CBC Radio, Megan Bonnell has announced a spring tour, which will see her performing at The Great Hall on April 4th. Presented by MRG Concerts, tickets are $19.99 + fees, and are available HERE. 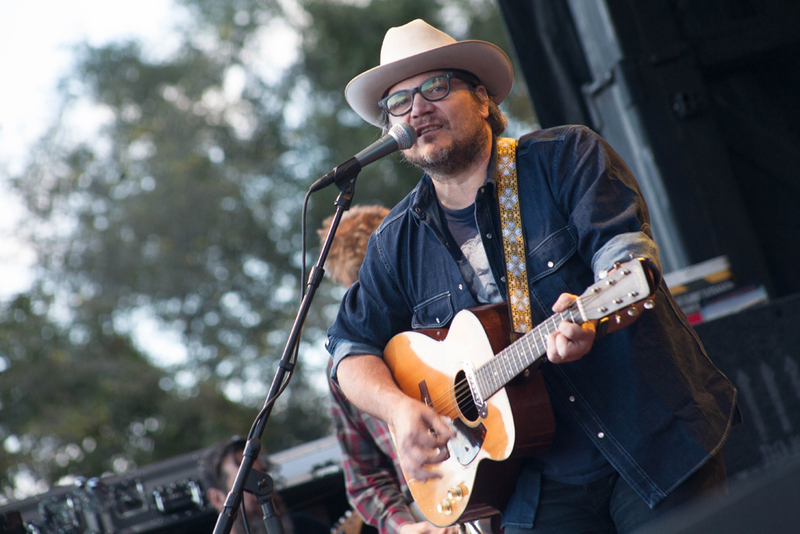 Jeff Tweedy had a busy second half of 2018, promoting the release of both his memoir Let’s Go (So We Can Get Back), and its companion album WARM. 2019 doesn’t look to be slowing down, as he will be touring, with a newly announced show at The Queen Elizabeth Theatre on April 3rd. The bad news is that tickets sold out super quick (as one would expect at this point in Mr. Tweedy’s career). The good news is that for those who did manage to snag tickets, you can request the songs you’d like him to play HERE. It doesn’t mean that he will definitely play the song, but it’s pretty cool that he gives the fans the chance to offer their input. Jeff Tweedy from TURF 2015, when he didn’t bring out Feist to perform “You and I” despite my request. Boooooo!! We now turn our attention to the other side of the globe. With the recent rise of Australian talent, Stella Donnelly is a name you won’t want to sleep on. She’ll be in town on Sunday, March 24th @ The Drake Hotel. The show is brought to you by Collective Concerts, and tickets are a very reasonable $13.50 + fees. They can be picked up at Rotate This & Soundscapes. Earlier this week, she dropped the first single from her upcoming release Beware of the Dogs, entitled “Old Man”, and if the song is any indication of how good that album will be, she appears poised to follow in the footsteps of recent Australian successes Courtney Barnett and Rolling Blackout Coastal Fever. The album will be released March 8th, via Secretly Canadian, and can be pre-ordered HERE. On April 11th, Patty Griffin will be coming to Toronto, in support of her soon to be released eponymous 10th LP. All that is known is that she’ll be performing somewhere in the city, and that she’ll be playing songs from that album, like “The River”. Stay tuned, and I’ll update with the details once they are out. *EDIT* – A venue has been announced. Patty will be at The Danforth Music Hall on April 11th. Ticket info to be announce. It’s been a couple of years since my last visit to New York, but boy did that video make we want to go back. It also reminded me of some of the great places in Toronto that I’ve loved over the last seventeen years since I first moved here, and some of the new ones that have popped up recently. Even though some of my favourite spots are gone now, Toronto is still a city I am proud to have grown to call home. One place that was almost lost, but has successfully been revived is where Sharon will be performing next month, with a performance at The Danforth Music Hall on Monday, February 11th. Tickets are $27.50 + fees and can only be purchased at Ticketmaster. Sorry folks, the record shops sold out of these one quickly. Nilüfer Yanya will open the show. Also coming out this week is Steve Gunn‘s new album The Unseen In Between, via Matador Records. There’s no Toronto date on his upcoming tour, but with new material I think it’s a safe bet that we’ll see him sometime before the end of the year. Warbly Jets released their Propaganda EP earlier this month, and will be playing next month at The Drake Hotel on Wednesday, February 13th with support from Moonwalks & Keegan Powell (of Chastity). Tickets are $15.00 + fees and can be purchased at Rotate This & Soundscapes. So, do you remember the band Guster? I saw them way back in 2000, when they opened for The Tragically Hip at Darien Lake, and was a fan of their song “Satellite” from their 2006 album Ganging Up On The Sun, but can’t say I ever kept up on them. Well, it looks like they’re still kicking around, as they’ll be playing The Mod Club on Tuesday, January 22nd, and they’re going to be playing music from a new album called Look Alive which is being released this Friday. Who knew? If you’re into checking them out, tickets are $25+ fees, and Rotate This & Soundscapes have you covered. In birthdays this week, Dolly Parton birthday turns 73 on January 19th. Growing up in a home where my parents listened to a lot of country, I heard my fair share of Dolly’s work, and I was always a fan of her duet with Kenny Rogers: “Islands in the Stream.” So to celebrate, I’ve chosen to include the Feist & Constantines cover because, let’s face it, whenever you get a chance to throw in one of your favourite bands, you just have to do it. Neither artist has any tour dates scheduled at the moment, though I did get a chance to see the Cons in Hamilton over the holidays and they played a few of the unreleased songs they’ve been playing at their random shows over the last few years. Here’s hoping a new album comes soon, as this April marks the eleven year mark since their last album, Kensington Heights. Can I Get a Witness?! – A photo I shot of Constantines at Lee’s Palace in 2015, for Live in Limbo. Click the pic to see the rest of the set, and read my review of that show. Girlpool‘s new album What Chaos is Imaginary will be release on February 1st, via ANTI- Records. They’ll also be coming to town on April 20th, performing at Longboat Hall with Hatchie as the opener. Not a bad bill for $17.50 + fees (Good job, Collective!). If you’re reading this, you might want to hit Rotate or Soundscapes to grab those tickets up before they sell out. A month before that show, in the same building, Spoons will be playing The Great Hall on March 23rd. Presented by MRG Concerts, tickets cost $29.50 + fees, and can be found HERE. Woo 80s! February 15th marks the release of HOMESHAKE‘s new album Helium, via Royal Mountain Records. He’ll be taking the new album on the road with a quick jaunt through Europe before coming back for a tour of the northeast US/Canada, which includes a stop at The Phoenix Concert Theatre on Sunday, March 31st (with support from Yves Jarvis). Tickets can be purchased at Sonic Boom…Ha! Just kidding. Pick them up at Rotate or Soundscapes, or online HERE. Ibibio Sound Machine have a new album, Doko Mien, being released on March 22, via Merge Records. They’ll bring their explosive live show to The Mod Club on March 23rd, and tickets can be purchased HERE (for $35 + fees). Ryan Adams announced last week that he would be releasing 3(!) albums in 2019, the first of which will be called Big Colors (not sure if he’ll release a version called Big Colours here in Canada, but he did hint at it for the UK). For those who have followed his career, you’ll know this isn’t the first time he’s been so ambitious. 2005 saw the release of three albums, including 29, Cold Roses, and my personal favourite of his albums, Jacksonville City Nights. So far, two songs from Big Colors have surfaced. “Doylestown Girl” (video above) and “Manchester” were both premiered locally in Pittsburgh and Manchester, UK. Expect those songs to hit streaming platforms soon, as well as information about album #3. Oh yeah, realized I didn’t mention that album number two is called Wednesdays. Closing out this week’s list is my pick for artist to watch in 2019: Ellis. She’s been steadily building buzz since the release of lead single “The Drain” last summer, and the subsequent release of The Fuzz EP in November (stream or purchase HERE). Her performance next Friday, Jan. 25th at The Monarch Tavern, as part of Exclaim’s Class of 2019 is the first show of what I’d expect to be a busy year. Tickets are $9.50 and can be purchased HERE. You won’t want to miss it. Be sure to check back next week! And if you have any suggestions or comments, please leave them here, or email at ryan@tunesinto.ca.